October 12, 2006 (Lake Forest, Illinois) How befitting that October, the month that wraps up with Halloween snacks, is also National Popcorn Month, celebrating the 17 billion quarts of popcorn that Americans consume each year. 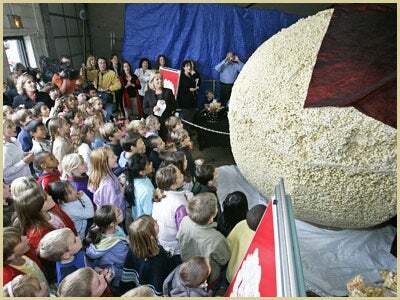 Today, The Popcorn Factory is celebrating in a record-setting fashion with the unveiling of the World's Largest Popcorn Ball, which is almost ten percent larger than the largest popcorn ball currently on record. In addition to the creation of this record-setting popcorn ball, The Popcorn Factory also is donating truckloads of popcorn treats to America's Second Harvest, the nation's food bank network, in locations across the country. 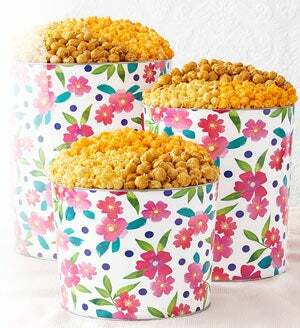 "Popcorn is relatively healthy and very fun snack for all ages," said Cheryl Zatz, vice president of marketing. "In celebration of National Popcorn Month, The Popcorn Factory is pleased to distribute popcorn treats, including its new, exceptionally delicious popcorn balls, to needy families in time for the holidays," she said. The gargantuan, sphere is a whopping eight feet in diameter, approximately 24.5 feet in circumference and weighs in at 3,415 pounds. To put it in perspective, the record-setting ball is almost 50,000 times larger than the normal popcorn balls distributed for retail consumption. The giant popcorn ball also is a celebration of the new proprietary recipe for the in-house production of popcorn balls, reminiscent of the taste associated with Grandma's kitchen. 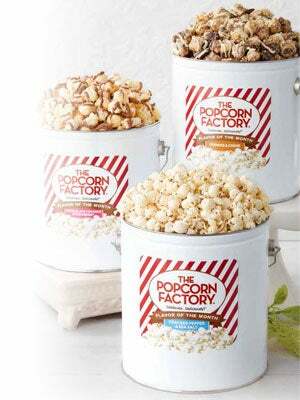 The Popcorn Factory, located in Lake Forest, Illinois, pops approximately 1,000,000 pounds of popcorn each year. 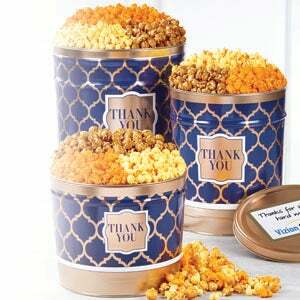 It packages approximately 60,000 cans of popcorn per week, the most popular being the three-way tin consisting of cheese, caramel and butter popcorn. 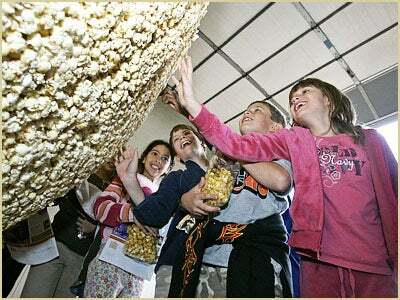 According to the National Popcorn Board, Americans consume 54 quarts of popcorn per man, woman and child each year. Approximately 70 percent of that is consumed inside the home and the peak period for popcorn sales for home consumption is the fall. 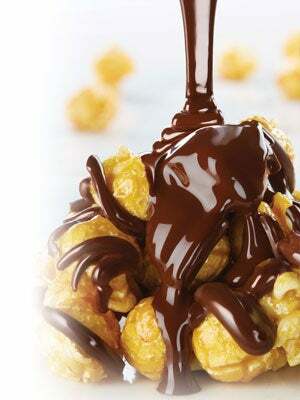 For more information on the wide variety of popcorn treats available, including the variety of original flavors created each month,and their delicious popcorn balls, please visit them online at www.thepopcornfactory.com. Weighing in at an astonishing 3,423 pounds, this massive record setter topped the previous record by over 200 pounds! The World's Largest Popcorn Ball measures an approximate 8 feet in diameter and was measured to have a circumference of 24 feet and 6 inches.